Opening Sentences: When Oscar was very, very, very small, Great-Granny took a piece of paper. Synopsis: Oscar’s Great-Granny is an artist. When Oscar tries to emulate her drawings and paintings, he falls far short. Instead of being down on himself for not having artistic talent, he becomes an art collector and starts bringing home art from art shows, flea markets, wherever he can find it. This becomes a lifelong joy for him. Why I Like this Book: It underlines the affirming fact that just as music needs listeners as well as performers and theatre needs an audience as well as actors, art needs collectors as well as those who produce artworks. I appreciate that Oscar doesn’t let his less-than-stellar artistic efforts define or defeat him, but he finds his own way to enjoy art. Activities/Resources: A child’s art collection could start as simply as cutting pictures from a magazine and framing them in inexpensive frames to decorate the child’s room. A next step might be to visit an art gallery, and its gift shop, and find a greeting card or print of an artwork that appeals to the child, allow the child to purchase it (preferably with the child’s own money) and frame it. Some art galleries, like the Seymour Art Gallery in Vancouver, have art shows and sales specifically for children (the Seymour’s is for under 16 years of age). The Mercer County Library’s “The Art of Reading” program has numerous suggestions for interesting children in art and art collection. Artist Natasha Wescoat gives several ideas for raising young art collectors. Another great selection Beth. I love this line in why you like it: I appreciate that Oscar doesn’t let his less-than-stellar artistic efforts define or defeat him, but he finds his own way to enjoy art. Thank goodness for museums, so we can appreciate art without paying a gazillion dollars for it too. I like Oscar finding art in so many different places. Thanks, Stacy! As someone whose artistic talents are mainly of the appreciation variety, I identified with Oscar! I love the way this book tackles the issue of “you may not have the talent to do it but it’s fantastic to embrace the talent to appreciate it”. Sometimes, that latter part is terribly overlooked. Wonderful idea, Beth! Like collecting poems too. oh — collecting poems is such a great example! Thanks, Catherine. Lovely choice again, Beth. i think this theme is rarely tackled in picture books, yet had great importance. Oscar’s attitude is just stellar! I’d love to see the illustrations to this! Thanks, Joanna. Too bad I can’t hold up the book and let you see the illustrations. 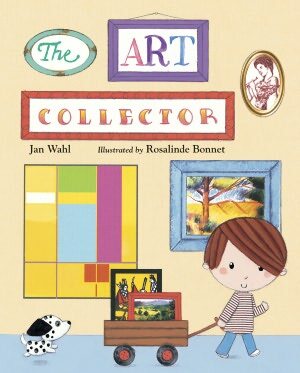 I really like this book and how the chld turned his love of art into collecting art. Your points are good, as are your suggestions for activities.. Like Catherine suggested, it could be applied to an artistic form. Great choice that I’d like to read! Thanks, Pat. Yes, it’s true in so many ways. Thanks, Susanna. It’s easy for a kid (or an adult) to get down on him or herself because of a perceived lack of talent. Finding the way they can appreciate others’ talents in those areas can help to turn their attitude around. At least, that’s the hope! What a fantastic book. I feel like Oscar and I are kindred spirits. I’m not a very talented artist either, but I took so many art history classes in college I almost had a minor. And nothing can keep me from art museums. All art needs people to appreciate and savor it. Thanks Beth! How cool that you took all those art appreciation classes! In one of my music classes in college, the prof paired works of music with works of art of the same period, which was very interesting. I love the premise of this book too! It also applies to writing. Not everyone is going to write a Pulitzer-Prize winning book, but that doesn’t mean we can’t appreciate them as readers. Great message! Oh, I so appreciate your relating this to writing and to reading! Perfect! I ADORE the premise of this book as well. My kids love art but are discouraged when they try to produce art and it doesn’t look they way they imagine it should. I would love to read this book with them. Thank you, Beth! Oh, this book sounds perfect for them! You’re welcome, Amy! Sounds like a lovely book. I appreciate the way that it affirms the art appreciator as well as the artist. Sounds lovely. You have some great activities listed. As usual, Beth, really nice review. I love the message of this book! 🙂 I would love to own this book! It’s a cool book, Erik! I bet Harleysville has it! This book has a great message. A great read for all kids, artistically creative or not. I love art, looking at it, or trying my hand at it.